The Greater Flagstaff Forests Partnership (GFFP) and its many partners are presenting a Harvesting Methods and Wildfire Preparedness Open House on Saturday, May 6, from 10:00 A.M. – 1:00 P.M. at the Aquaplex in Flagstaff. 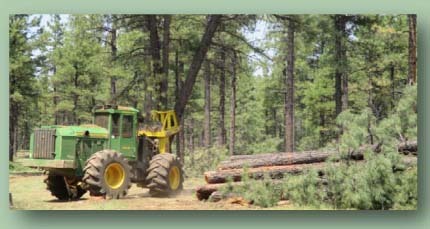 As the pace and scale of forest restoration efforts increase throughout the area, this is an opportunity for the community to experience and learn about the various timber harvesting methods that will occur on projects, like the Flagstaff Watershed Protection Project and the Four Forest Restoration Initiative, and the measures taken by professionals to reduce the risk of severe wildfires in our forests. Forestry and fire staff from the Forest Service, City, State and many other partners will be on-hand to discuss current and planned thinning operations. Community members will have photo opportunities with Smokey Bear, real woods loggers and fire fighters, as well as getting close and personal with logging equipment and fire trucks. Residents will also have the opportunity to gain valuable insight on how to protect their homes, property, and family from wildfire. Other exhibits include: NAU Timber Sports demonstrations, forest treatment operations videos, a kid’s corner, and refreshments. This event is sponsored by the Fire Adapted Communities Learning Network and is held in conjunction with the National Wildfire Community Preparedness Day. Visit http://www.fireadapted.org/ to learn more about becoming a Fire Adapted Community and, http://www.gffp.org/ to learn more about the Greater Flagstaff Forests Partnership.